The Wednesday before Easter, thanks to a press event for a company I cover, I had my first chance since moving permanently to New York to go up the Empire State Building. 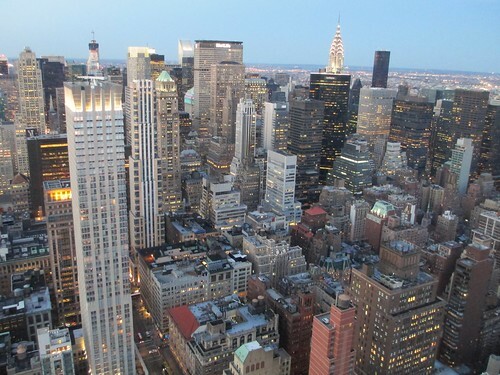 Yet, as I gazed out from the 58th floor, I found myself struck by something other than the extraordinary forest of skyscrapers crowded, like trees straining towards the light, in midtown Manhattan. Looking south, it was clear how the forest canopy seemed to lower around Greenwich Village, SoHo and the Lower East Side into a less dense area of undergrowth or bush. 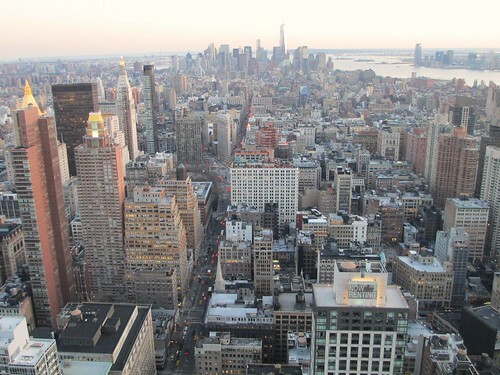 It then rose again at the final, dense clump in the Financial District, teetering on Manhattan’s lower edge. Midtown's skyscrapers: the lack of a "cyclists welcome"
The view came to my mind the next day when I had to return to midtown for a television appearance at Fox News’ studios on Sixth Avenue. I rode up the Hudson River Greenway as far as 48th street. Then I started pedalling across town into the forest on which I’d been looking down the night before. The deeper I cycled into the mid-skyscraper canyon, the worse conditions became. I was constantly navigating around jammed-up traffic and dodging sites where workers were fixing pipes and cables. I was left wondering if, efficient though they can be, the densest parts of very dense cities such as New York are doomed to be fundamentally problematic places for human-powered transport. 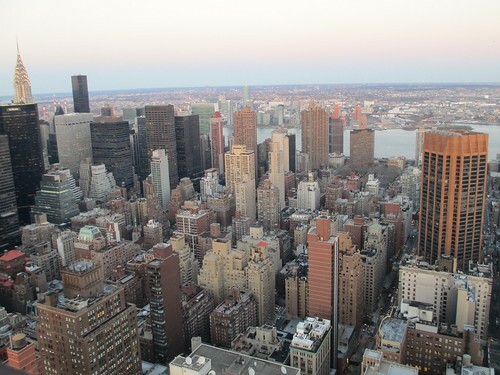 The question’s relevant because many cities around the world are trying to accommodate their expanding population not, as New York City did for much of the 20th century, by sprawling outwards, but by becoming denser. There are calls for London to build new, higher buildings to absorb its growth. There is a similar movement in many parts of North America. It’s easier, so the thinking goes, to serve dense cities with public transport, since more journeys’ starting and end points can be an easy stroll from a station or bus stop. Wouldn’t it be ironic, I thought to myself, if such a movement – intended to make cities more environmentally friendly – made them worse for the bicycle, the most environmentally-friendly transport mode? It’s certainly tempting as one grapples with the reality of riding in midtown Manhattan – as I used to every day before my office moved downtown – to flirt with the idea that it’s a lost cause. The area crams into densities that in many cities would be associated with slums and squalor a mixture of high-end housing and offices teeming with some of the world’s best-paid professionals. No-one has the space or inclination to undertake a vast range of everyday activities but most have the money to pay to have them done. A stream of dry cleaners, express parcel services and food delivery cyclists consequently flows to and from the area’s offices and apartment complexes, giving the area the feel of being some vast apartment hotel crossed with a serviced office. Since many of the best-off people feel themselves too important or fancy themselves in too much of a hurry to head into the subway, taxis and limousines buzz constantly around the doorways. The business of supplying food for the millions who swarm the area on a weekday would alone be enough to create a substantial traffic jam. The same goes for the business of keeping the people’s water, electricity, gas, sewage, hot water, internet, cable television and other services running smoothly. Almost none of the people engaged in the stressful business of meeting the area’s needs seems willing to take cyclists’ needs into account alongside the multiple other pressures they face. Cycling can be a slow, stressful business of zig-zagging around double-parked delivery vans, slipping past the edges of traffic jams and swerving to avoid the woman who leaps into the cycle lane to hail a taxi. The intimidating atmosphere reminds me how I quailed, when it looked as if I might get a job in Hong Kong, at the thought of cycling there. 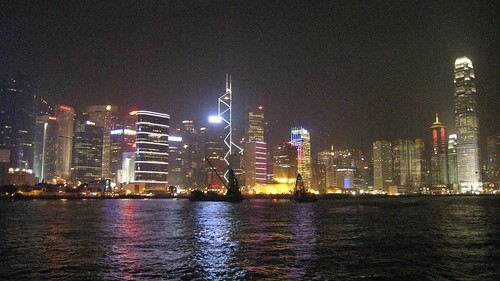 Hong Kong has twice New York’s population density. I started to wonder if it might be London’s lower density – half New York’s level – that makes it generally an easier (if still severely flawed) place to cycle on-street. Yet an incident later the day I appeared on Fox made me ponder how far space and density really were the problem. 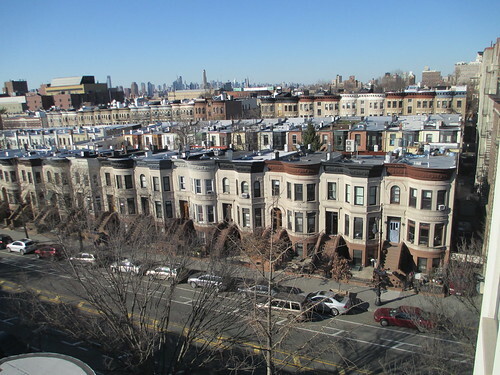 I cycled after work to Brooklyn to participate in a Maundy Thursday church service and headed off home afterwards down Garfield Place in Park Slope. I sped down the street, between rows of parked cars, at over 20mph, riding in the middle of the lane for fear a still-faster car would try to pass me. Sure enough, after a couple of blocks I noticed a Jeep Grand Cherokee close behind me, its driver clearly trying to barge me out of the way. I found myself, not for the first time, terrified of being hit from behind if I made a mistake but fearful also that, if I slowed down to pull out of the way, the driver would hit me before I was out of the way. I realised, instinctively, that the problem was less one of space and more one of speed. I am far happier to have a vehicle pass me on a narrow street at a reasonable speed because the scope for disaster, the room needed to correct a mistake, is so much smaller. I won’t let someone intent on breaking the speed limit on a narrow residential street pass me, because his speed has eaten up the room for error around his vehicle. We discussed some of these issues and a few more – including when he might learn to drive safely since he clearly didn’t know at present – at a red traffic light at Garfield and 5th Avenue. When I factored speed into midtown conditions, I suddenly saw them in a very different light. The problem wasn’t so much, I realised, that there were so many delivery trucks and other commercial vehicles (although it wouldn’t hurt to switch some of these deliveries to cargo bikes). The problem was that those slow-moving vehicles had to stop every cross-town block to accommodate lines of vehicles sweeping up and down the avenues. I suddenly had a vision of a fast-moving taxi as taking up twice or three times its own road space as one that was stationary. The genius of the New York subway and other urban metro systems struck me. They take the problem of moving people fast – and consequently with lots of space around their vehicles – pack the people into space-efficient vehicles and bury the speed problem below the streets. Looked at it in that context, it becomes clearer that the real problem in New York lies not in midtown but in the low-rise areas I could see from the Empire State Building, stretching away towards the horizon. In New York and London – and even more so in many other big cities like Los Angeles and Houston – those distant suburbs were built with very little public transport provision. The only realistic way to get about, many residents feel, is to use a motor vehicle. To overcome their distance from the centre, the only way is to drive them fast. To cater to them, cities have built vast, space-eating high-speed roads. A significant part of midtown’s traffic problem is made up of people who drive all the way from those suburbs to work in the city centre. The sheer unpleasantness of the world that way of living has created came home to me this Saturday as I cycled to meet my family for a day trip to the beach at Coney Island, on the edge of Brooklyn’s low-density sprawl. 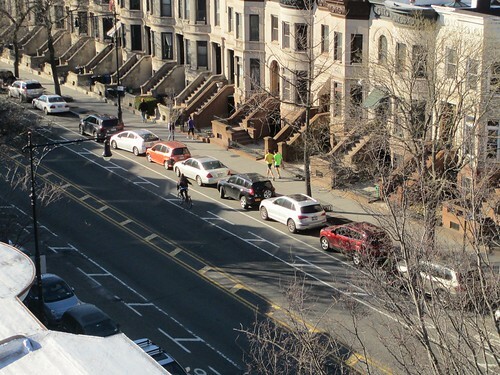 To cover the last stretch from a harbour-side cycle path to the beach, the marked cycle route heads onto Cropsey Avenue, a terrifying six lanes of suburban automotive culture full of vehicles seeking to drive at 40mph or faster. Far from taking the lane to tame these barrelling lumps of high-speed steel, I found myself letting my fear get the better of me. 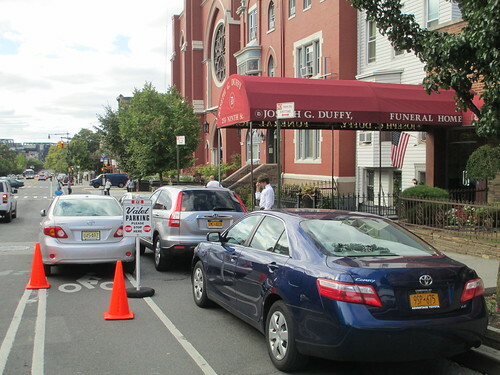 I cowered - as I once did when cycling in Staten Island - in side streets at each intersection, waited for the herd of charging cars to sweep past. Then I pedalled off after them as fast as I could, hoping to outrun the next charge.At the corner of Cropsey Avenue and Neptune Avenue - a few yards from the Invisible Visible Girl’s school – I shouted at motorists turning fast through a crossing where a man and his daughter were struggling to cross the street. quite as grim as Cropsey Avenue? 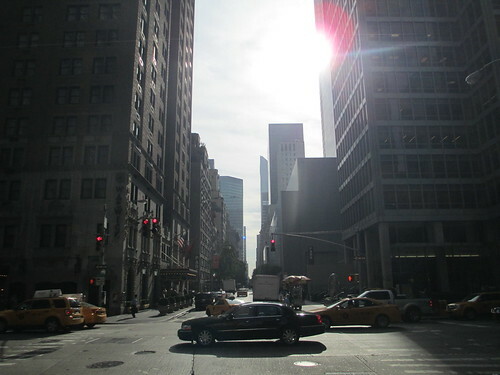 It remains a stressful and forbidding experience to cycle in the heart of midtown Manhattan and in the densest parts of many other cities worldwide. Although I know space-efficient bicycles have many advantages as a means of urban transport, I don’t know precisely how I’d carve out space on the streets of midtown – or, come to that, the City of London or Hong Kong – to encourage people less hardened than I to cycle. But, following Saturday’s experience, I feel confident on one point. While W48th St might be chaotic and stressful, it could yet become a healthy, functioning urban space. I’m far less confident the same can be said for Cropsey Avenue. It’s one of those tasks that’s so difficult it’s become a kind of fascination to me. 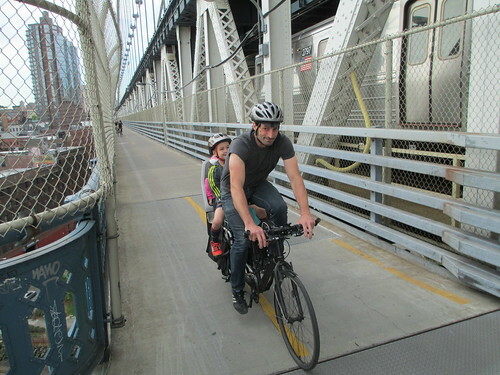 When I ride over the Manhattan Bridge towards work each morning, I’m generally passed, at a gap of just a few feet, by a B or D subway train taking commuters into Manhattan. The passengers stare out the window, blankly, apparently staring straight through those of us labouring up the slope to the bridge’s summit or speeding down from it. The stares are so blank that I’ve taken to waving at individual commuters to see if I can get a reaction. the subway passengers can't see the cyclist. Fact. The net result so far, from scores of waves, is one half-smile – and she might just have been reacting to a witty lyric on her iPod. The experience of being in a subway train seems to be so utterly different from the experience of riding a bike that the people on the subway trains can’t react to a human being outside their train on a bike. Yet the reaction of the subway commuters to cyclists, it’s dawned on me, is only one example of a far more widespread city phenomenon. Big cities are full of people moving around conscious almost solely of their own environment, their own needs and their own sense of right and wrong behaviour. We’re mostly gliding around in little bubbles of our own distinct worlds, over and below each other, avoiding contact as far as possible. 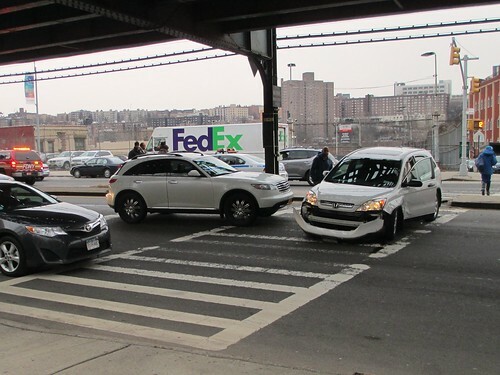 But quite a few of the crashes in cities, it strikes me, are cases where, almost literally, two worlds – two contrasting sets of expectations about norms and behaviours and who should give way to whom – collide. This makes it a phenomenon worth noticing and exploring. The driver I encountered on 55th street in Manhattan 10 days ago illustrates the most obvious form of the problem. I’d spotted that he was driving erratically as he left a parking space near Broadway. He then squeezed past me, dangerously, driving in a parking space, only for me to catch up with him at the traffic lights at 9th avenue. His window was rolled down and he was deep in a conversation on his mobile phone. “Stop talking on your phone!” I shouted at him. “It’s making you drive like an idiot.” He gave me a dirty look and slowly rolled up his heavily-tinted window. I was an unwelcome intrusion from outside the two worlds he was carrying around with him – the world inside his sports utility vehicle and his interaction with his interlocutor in the telephone call. His reaction was to close down his interaction with the place where he was physically present – and where his driving presented a serious danger. There are multiple ways that people pursue the illusion that their cars are private spaces. They can blast out music so loud that any outside intrusion is inaudible. They can choose to drive a car so large or so fast that it intimidates other road users. They can talk incessantly on the telephone to people outside their immediate confines. People want to drown out the mixture of stress and boredom that comes from sharing a city street with a host of other people with competing claims on the space. Their desire to do so makes the street a little less safe for pedestrians, cyclists – everyone outside their world-in-a-car. The little bubbles in which people move around also reflect their culture. At my son’s school, it’s mostly the parents with the mild, mid-western accents of hipster incomers that arrive bearing their children on long bikes, tandems and other unlikely bits of cycling apparatus. If I see children spilling out of some huge SUV – there’s a family that arrives daily in a Cadillac Escalade, one of the biggest vehicles on the road – I’m far more likely to hear a traditional Brooklyn accent calling out after them. The cyclists, I suspect, mainly mix with the other cycling-inclined families and have firm views about the environment, physical fitness and cluttering up the area with cars. The Italian-American SUV drivers come to the school from outlying areas of single-family homes. Many, I suspect, feel that a big car is both a status symbol and a way of keeping one’s loved ones safe. I'm sure they tut-tut quietly at the risks the rest of us are taking. We maintain our contrasting cultures while sharing the same bits of road partly through the impermeability of a big car’s steel sides. It’s no coincidence in my view that cars that keep the outside world at bay are far more popular than, say, convertibles for city driving. But it’s not only the motorists that are travelling around in little bubbles of their own worlds. Look on the average city street and nearly everyone is cutting him or herself off from the wider street. Headphones – once limited to discreet earbuds – are now often a large and obvious symbol that the wearer wants to be left alone. Mobile telephone calls and texting take the participant away from his or her immediate surroundings. For many runners, they seem to form an almost indispensable aspect of the experience, providing the rhythm and focus that interaction with the wider world might take away. A pedestrian cursed at me the other day on the Lower East Side for riding, perfectly legally and safely, onto a bike lane across a small city park. It's no coincidence, I think, she was a runner sequestered from reality by her headphones. they look close together. But they could be worlds apart. The question, of course, is how far any of this is a bad thing. 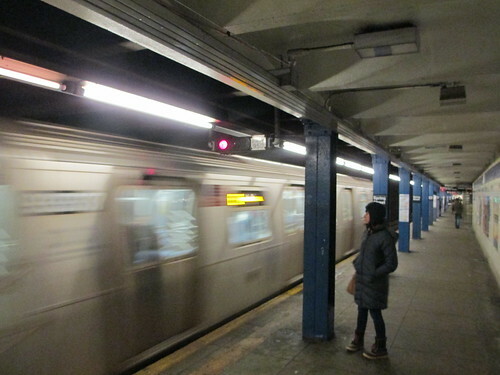 Would New York City – or any other big city – be a better place if subway commuters were waving to me every morning? Should I expect that runners eschew headphones to try to make their runs as pure an experience as possible of interacting with the city? I’m inclined to say no. When a behaviour is as widespread as this retreat by city dwellers into their private worlds, it suggests a deep need. This is part of how inhabitants of big, densely-packed cities get by without assaulting each other or rioting more often than they currently do. I'm struck, however, that it’s often the people least cut off from the reality of the city around them – cyclists out on the streets, intensely aware of all that’s going on – that are disproportionately involved in campaigns to make the streets safer. It’s a serious safety issue that so many vehicles allow their users to cut themselves off so thoroughly from events outside. It’s hard not to imagine that people with clearer views of pedestrians and cyclists and fewer barriers to hearing street sounds might be less likely to run them over. I have no immediate policy magic wand to wave to bring about that change of perception. But an idea came to me the other night as I undertook a late night ride home past the still-buzzing bars and music venues of Bleecker St, the Greenwich Village street where Bob Dylan performed many of his earliest gigs. In Talking World War III Blues, one of the songs from that early era, he describes a dream about being the lone survivor of a third world war. Then he remarks, in the last verse, that many other people seem to have similar dreams. "Everybody sees themselves/ Walkin' around with no-one else," he says. Not everybody’s dream can be right, he says. "I'll let you be in my dreams if I can be in yours," he drawls. That's the nearest I have to a solution. I'll let you be in my street-world if I can be in yours.